The Participatory Museum is a practical guide to working with community members and visitors to make cultural institutions more dynamic, relevant, essential places. It was written by me, Nina Simon. I’m a museum director, former design consultant, and the author of the Museum 2.0 blog. The book is available for purchase, perusal, and discussion. In the time since it was published in 2010, over 25,000 people have bought the book, and another 200,000+ have read the online version available for free on this site. The Participatory Museum has been described as a “future classic of museology,” an “indispensable guide,” and just a darn good book to read. 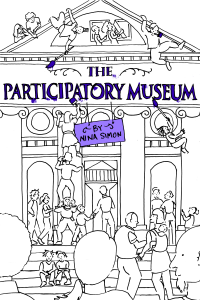 Nina Simon’s new book is essential for museum directors interested in experimenting with audience participation on the one hand and cautious about upending the traditional museum model on the other. The book is well written, interesting, well researched, and useful. It will encourage and support those who wish to begin. Simon dissects the process of participatory change, showing how to make choices that will augment, without overturning, the museum’s current programs or mission. In concentrating on the practical, this book makes implementation possible in most museums. More importantly, in describing the philosophy and rationale behind participatory activity, it makes clear that action does not always require new technology or machinery. Museums need to change, are changing, and will change further in the future. This book is a helpful and thoughtful road map for speeding such transformation. For more reviews of The Participatory Museum, click here.